LightScribe technology offers consumers and businesses a simple, no-hassle way to burn professional, silkscreen-quality labels on their CDs and DVDs. Using the same laser that burns data in their disc drives, customers burn their data as always, flip the disc over, re-insert it into the drive and burn a precise and permanent iridescent label. Mobility: Burn labels wherever you burn a disc, no need for printers! 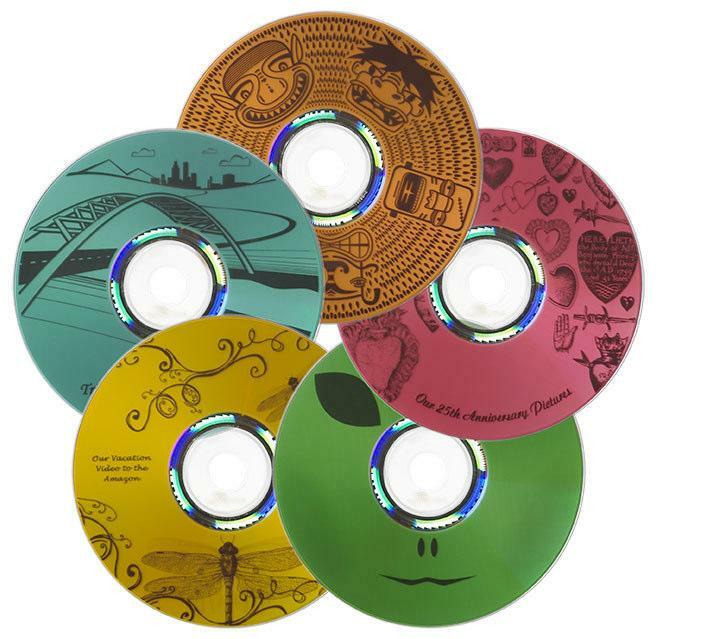 Creativity: Combine text and graphics to personalize discs. LightScribe-enabled optical disc drive (ODD) – The drive can be either built into your desktop or notebook PC or you can use an external disc drive. LightScribe-compatible media – LightScribe CD/DVD’s utilize a special coating applied to the disc surface that interacts with the laser of the LightScribe-enabled disc drive. 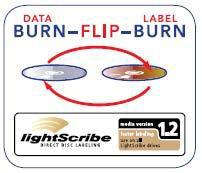 Consumers can readily identify LightScribe-compatible media through the LightScribe logo found on media packaging and in the lower hub of each disc. In order to get the best results for burning audio on blank CD-R media, it’s important to have some basic information about the CD burning process. The three factors that will determine the overall quality of your burn are the type of burning hardware, the type of CD you’re burning, and the speed you choose to burn it at. The type of burning hardware will mostly affect the consistency of the burn. A laser is a laser, and because of the digital nature of CD’s, there is no such thing as a physical error on a CD itself – the data is either a 1 or a 0, a bump or a flat surface, a translucent area or a darkened one. However, the process by which those digital bumps are burned into the surface is truly analog, so if the hardware or laser assembly is inconsistent or faulty, the result will be a bad or unusable burn. The biggest difference the type of CD you’re burning onto will make is how long the data will last. Typically, inexpensive CD-R’s will have data loss much faster than more expensive ones. Since CD-R burning technology is relatively new, there isn’t going to be data to tell if these discs hold up for 50 years or not. The common consensus is that commercially produced CD’s will stay usable the longest (with some specific dyes and chemicals being considered “archival”), and that more expensive CD’s with high quality materials will last longer than more cheaply made ones. This is one case where you get what you pay for! Taiyo Yuden has the best reputation for audio quality, with companies like Verbatim, Mitsui, Sony close behind. When choosing CD’s for your audio burn, be sure to look up the most recent buyer reviews. The speed you chose to burn your audio CD-R at can potentially have a major impact on the quality of the eventual product as well. The slower the speed, the sharper the edges will be on the dyed vs. non-dyed segments of the audio, and the more accurate the burn will be. The write laser of your burner is simply on or off, but at high speeds like 24x or 48x, jagged or blurry edges on the CD surface can cause jitter or potentially even skipping. Recognize also, that burning wav files is different than burning mp3’s. Much of the data is already gone from the mp3 files, so the addition of a quick burn to an already lossy-encoded audio file may lead to audio artifacts. Musicians and producers will often suggest burning as slow as at 2x or 4x speeds. For your best audio quality, burn uncompressed audio files with well-maintained CD-R burner, with high quality CD-R’s at a low speed. Your ears will appreciate it! There are two options for printing text and designs on CD-R or DVD-R media – inkjet printing and thermal printing. These two processes have different methods of transferring ink onto the surface of discs, so they use different types of materials that work with either inkjet printable or thermal printable blank media. CD/DVD inkjet printers spray tiny dots onto specially designed “inkjet printable” CDs which have a surface that is specifically created to absorb this ink. These dots are smaller than the diameter of a human hair, and can combine from basic ink dyes to form the whole color spectrum. The process of printing on inkjet CDs and DVDs is just like a standard paper inkjet printer, only you’re printing on the disc surface instead of paper. Primera and Microboards have consumer and commercial grade CD/DVD inkjet printers that can produce results varying from printing basic text to photo quality images and range in price from a few hundred to several thousand dollars for automated systems. With a quality color inkjet printer prints can be of extremely high quality, up to 4800 dpi. In other words, you can essentially print a photograph on an inkjet-printable CD or DVD with the correct printer settings and an appropriately detailed design. However, because of the nature of ink and the variable quality of CD-R and DVD-R printing surfaces, the images on inkjet-printed discs will fade over time. For instance, you would not print a commercial barcode with an inkjet printer and expect it to be permanently useable for 10 years or the life of a CD. Inkjet ink is also susceptible to weather, dampness, heat, and light over time. Thermal printing is more often associated with professional duplication and design work. A CD or DVD that you purchase from a store as a movie or music album has been silk-screen printed. The printed surface is permanent, the surface can be shiny, the edges of the colors are sharp, the text is crisp, and there can be the feel of raised ink. Thermal printing has similar characteristics to silk-screened printing. Thermal printers produce a permanent image; they use heat and pressure to transfer print materials to the disc surface rather than spraying ink. Single, dual and multi-color ribbons are used during this transfer process for full-color output. Results from thermal printing are very durable and resistant to weather and wear, but the print resolutions can be less detailed than inkjet printing, topping out at about 300 x 600 dpi. As far as cost goes, the initial investment in an inkjet printer is less than a thermal one. Both types of printers are designed to run in a production environment where discs are being created every day. Thermal printers are typically more durable and suited for the production environment that requires high-quality permanent color printing. Beyond this, full-color prints cost about the same for both. Blank printable media for inkjet or thermal printing are also very close in price.